Confidence is probably the most frequently talked about psychological factor. Confidence is typically noticed the most when it’s gone missing, so as a result effort is typically invested in restoring confidence. If you build your confidence systematically through your training you can aim for a situation where you always know that you’re in the situation where you have optimal confidence at the times when you most need it. It’s worth considering the challenge of getting your confidence to peak at the right times in exactly the same way as you look to get your physiology to peak. create a robust foundation through all of your training and preparation that you know will not be compromised – a robust base, a bullet-proof core. be clear when you’re peaking for a performance and consider the specific challenges that you’ll face for having peak confidence when you need it. Ensure that your confidence has been fine tuned from the solid base to be completely focused on stepping up to the specific challenges you’ll be taking on. 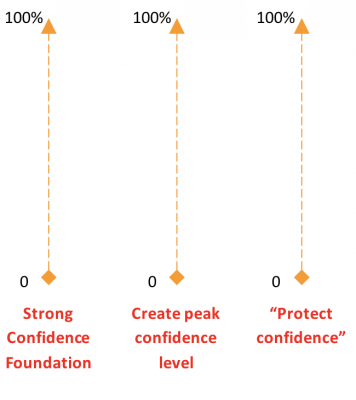 protecting confidence– identify specific situations where your confidence is challenged and be ready for these so that they don’t reduce confidence excessively. The greatest performers have got the balance just right between having a really strong/high level of confidence, but having a great ability to ‘not lose confidence’. Building a strong confidence foundation AND not losing confidence easily should be the combination you are constantly striving for. To work out the relevance of each of these areas for you, it’s worth getting a feel for what your profile looks like on the 3 scales in combination. Have a look at the 3 scales below and mark yourself on each line to show where you’d score yourself for each of the 3 different components. If you connect your scores on the three scales and you haven’t got a straight line through each of the 100%’s, then look at the performance benefit you think you might get from raising your score on the appropriate factor.If you can see a direct performance benefit to be gained from making the improvement, then take action. Here are some key reminders that are worth evaluating relative to building and maintaining confidence. Know your strengths inside out so that you maximise impact of getting rid of weaknesses (in a lot of cases people spend all of their time focused on getting rid of weaknesses without having a strong grip on the strengths base that is beneath them. This creates an overly negative view of capabilities and can lead to a loss of confidence). If you don’t keep focused on your strengths frequently enough, you’ll easily find yourself going out to perform with the aim of minimising the negative impact of your weaknesses, rather than striving to exploit all of your strengths. Defensive mentality versus Attacking mentality. It’s clear that you have to work on weaknesses in order to improve performance. The golden rule to be taken from number 1 though is to follow the course of i) identify and value your strengths, ii) ensure strengths are exploited consistently and you can always deliver on them, iii) when ii has been achieved, begin to focus on reducing the negative impact of weaknesses, iv) once weaknesses have been reduced, focus on seeing if you can begin to add them to your strengths pool. A lot of problems with confidence occur when you cut straight to iii and iv and begin working on the negatives without a real understanding of your core performance strengths. No-one’s ever complained of having too much confidence! As long as the confidence you have doesn’t result in complacency then keep fuelling your confidence so that it’s as high and robust as possible. Check out your self-talk. The way in which you talk to yourself will give you a pretty good insight into how you’re influencing your own confidence. A useful check for your self-talk is to tune into it and then imagine that the words you’re saying to yourself are coming out of a coaches mouth. What would the impact be on your confidence if a coach was speaking to you in the way that you speak to yourself? If you’re not happy with what you hear, then work out what you would want to hear and fuel your own confidence by ensuring that you’re talking to yourself in that way as consistently as possible. Being confident doesn’t mean being positive for the sake of being positive. Facing up to problems and attacking them with maximum conviction is essential. So get the balance right between facing up to the reality of the challenges you need to take on and making sure that you take on those challenges with maximum belief and optimism that you’ll ultimately be successful. Confident body languageis an important factor to make sure you always benefit from. Being confident in your demeanour is an obvious variable to always exploit. So, how good are you at ALWAYS making sure that at key times your body language is having the best possible influence on your performance? Confidence is infectious, as is lack of confidence. Therefore, from a team perspective always look to make sure that you’re maximising your confidence so that you spread your confidence in yourself to other team members. If you’re confident in yourself, then it’s much easier for everybody else to be confident in you and just focus on raising their game without having to worry whether every body else is up to the challenge. The PROCESS/OUTCOME balance is critical in building and maintaining confidence. As much as possible ensure that you gain as much confidence as possible from all of the processes that you successfully deliver day in, day out. These repeat processes are your multiple injections of confidence to benefit daily from, rather than simply waiting for one large shot of confidence that comes from the occasional outcome or result. Grab the result injections when you can, but bank on process! All of the confidence information above is focused upon you being maximally confident in your capabilities as an athlete – being confident in the process of training and performing, being confident as a result of the qualities that you carry around with you because of who you are and how you’ve developed your abilities. There is very little reference above to getting confidence simply from winning or beating other people. Winning is obviously critical and having confidence that you know “how to win” is the kind of winning confidence you should be striving for. In terms of the well coined “control the controllables”, your quest should be to make as much of your confidence as possible all about you. The more that you take steps to ensure that your confidence is defined and refined by factors that are directly under your control, the stronger your confidence base will become. Your confidence is such a valuable commodity that it’s worth making sure that you’re putting as much of it in place a possible, so that you can draw on it whenever you most need it. Remember, confidence is ultimately knowing that you’re going to do what you say you’re going to! So, are you practising doing what you say you’re going to? Think ahead to a crucial time on a start line, and you’re sitting their absolutely knowing that you’re going to do what you’ve planned to do… now that’s a position of confidence.